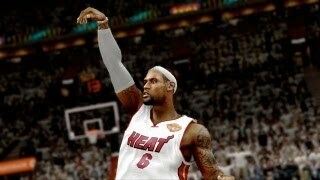 NBA 2K14 — спортивная игра от студии Visual Concepts. В NBA 2K14 игроки принимают участие в чемпионате по баскетболу. В отличии от NBA 2K13, в 2K14 реализована более реалистичная физическая модель поведения баскетболистов, а также улучшены другие элементы игрового процесса. It’s a credit to NBA 2K14 that despite not one but two new basketball sims looming on the next-gen horizon, it still managed to draw my attention squarely to the current-gen court and keep it there. An unexpected Xbox One knockout and a year-on-year improvement in every respect - but its spectacular visuals make the clunkier elements painfully obvious. Like all annualized sports franchises, NBA 2K14 is coming at the end of a cycle and of an era. Even though the next gen version is nearing completion at Visual Concepts, the devs didn't forget about fine tuning the PS3 and Xbox 360 versions, adding exclusive content and a sleeker gameplay. Overall, NBA 2K14 gained in rhythm, the dribbles are easier to manage and the defense system rocks. Add to the mix new crazy animations and you'll have a good picture of what NBA 2K is today. We can also enjoy the presence of Euroleague even if the 14 available teams (not including France) are restricted to exhibition matches, which brings some fresh air to the roster. On the other hand, we were let down by Lebron James's mod "Path to Greatness", badly made just to justify the King's presence this year. But those drawbacks are quickly forgotten because NBA 2K14 still reigns as the master on the court. It's the finest simulation of basketball out there and this year's entry in the series is bolstered by smart and simple additions. A stunner, refreshing the tried-and-true formula with fantastic visual pop and engaging new modes. NBA 2K14 is the best NBA 2K experience in terms of gameplay, immersion and pleasure, and it's even better on next-fen consoles, with amazing graphics. This edition is not only a smooth-flowing piece of pro basketball simulation, it’s also one of the few games that makes a true next-generation leap in visual fidelity. For those that already dipped into the 2K14 sauce, this upgrade feels a bit stripped down in some areas. Still it has that next generation look and feel that is impossible to ignore. For those that haven’t already jumped in, it is a no-brainer. This game is a must-have for fans of the NBA, and even for some that are not. Rather than simply port the current generation version of NBA 2K14, Visual Concepts deserves praise for drastically renovating its two most popular modes for its next-generation console debut. Both MyGM and MyCareer are promising redesigns that take the franchise and single-player modes in interesting new directions, making this the definitive version of NBA 2K14 to own if you prefer to play this way. But once again, Visual Concepts has left online fans wanting. 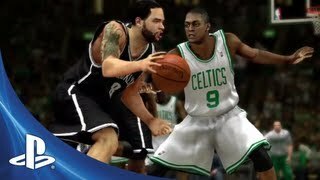 There is so much to see and do in NBA 2K14 it can feel overwhelming for someone like me who isn’t a huge fan of the sport. The sheer attention to detail and ease of use though really drew me into the experience. The Lebron story mode is a novel idea, and the presentation is simply awe-inspiring. For the third year running, 2K has modified the right analog stick inputs, but luckily 2K14's Pro Stick is the best arrangement to date, letting you shoot, perform flashy passes, and put up your hands on defense with ease. It's a comfortable addition that streamlines some functionality, though the familiar button controls remain for series vets. Visually everything is stimulating, the sounds are present, and you sense the atmosphere of the surrounding the action. NBA 2K14 isn’t ground-breaking, but still a very solid game. Simply put, NBA 2K14 is better than NBA 2K13, and worth buying even if you picked up last year’s release. NBA 2K14 — лучший баскетбольный симулятор на ПК и консолях минувшего поколения. И лучший вовсе не потому, что единственный. Все еще лучший баскетбольный симулятор на рынке, но страдающий от недостатка свежести и новых идей. Despite the occasional technical missteps, NBA 2K14 is a great experience that deftly captures the essence of what makes the NBA so appealing. NBA 2K остается лучшим баскетбольным симулятором в нынешнем поколении консолей, а в плане презентации оставляет позади даже футбольные и хоккейные игры от EA Sports. The on-court action in NBA 2K14 isn't markedly different from the way the current generation versions play, which means its excellent, and by far the best we've ever seen in virtual basketball. NBA 2K14 on the PS4 is a stunning digital facsimile of basketball. The title’s visually jaw dropping, technically stunning, and represents a whole different ball game to its PS3 counterpart. The new My Career and My GM campaigns don’t always score a slam dunk, but they’re engaging enough to dribble your way through, making this is a top option if you’re eager to shoot some hoops on Sony’s next generation console. Sure, it's missing the current-generation's marquee mode, but the on-court action is every bit as engaging and hospitable as it's always been, and the visuals are more impressive than ever. NBA 2K14 is great, yes, but somehow feels like a missed opportunity. It's the first NBA 2K title in years that I can't unequivocally recommend — especially with next-generation versions of the game only six weeks away.